Dinner last night was something new, a yummy pot of cream of mushroom chicken with potatoes and onions. Unfortunately, scared of the potential points value of the cream of mushroom, I did not bring some home with me. 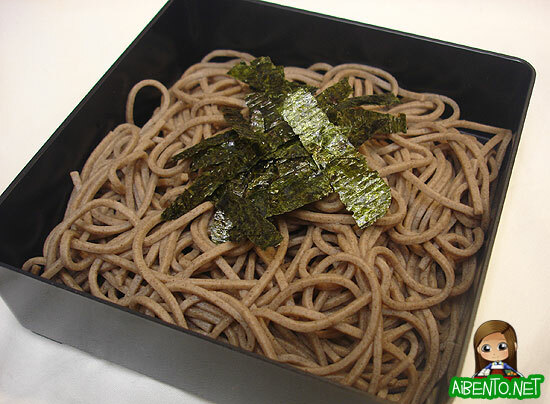 I took the leftover-less opportunity to make today’s lunch zarusobaZarusoba is technically a dish of buckwheat soba noodles served in a basket or on a bamboo mat. I didn't know this at the time, thus the incorrect usage of the term! and the last of the miso pork, which was oddly frozen into the shape of Cro Cop’s twisted foot. O_o? For some reason when we got home last night I wanted to splurge on something. I’d gotten away with a 3.5 point day, so I decided to spend my points on… rice. Haha! I’m indulging in rice. I can’t wait to get to my goal weight so that I can finally eat all white rice again on a daily basis. I cooked one cup of rice and took half for my bento. The other half… well… that is going to into my sinful breakfast of egg rice with microwave nuked hot dog. 99% of you are likely thinking, what the hell is egg riceAlthough local Hawaii people call it 'egg rice', this simple dish consisting of a raw egg, hot rice, and soy sauce is referred to as 'tamago gohan' in Japan. This translates into... 'egg rice'.? It’s rice with egg, duh! Select HiloHilo is the small town on the Big Island of Hawaii that I grew up in. natives know wat I stay talking about. You take one bowl of hot rice an’ crack one raw egg ovah em. Den you mix em up wit like one teaspoon shoyu an’ den top wit one 15 second-nuked hot dog chopped into fours. Some ono let me tell you! Ok the pidgin is over, my mainland readers can stop the head scratching now. Perhaps I’ll post a picture of it later. I doubt any of you would try it and like it. Egg rice probably falls into the mainland “Ew they eat Spam” category. Anyway, the bento consists of miso pork, rice with ume, green beans, and sakura carrots. I put the meat into a foil like cupcake cup. Hopefully I won’t repeat what I did with the meat loaf garden, which was to press “Reheat” and then walk away only to remember after 5 minutes of microwaving that I’d lined the bottom with aluminum foil. Oops!! I have a ton of dishes tomorrow, 4 in all since I’m taking the sauce plus a fruit container. Sometimes it seems like I’m eating more than I ever was, but I’m finding that bentos are great to help with portion control and food group balance. Says the person who will be rice gorging today… With the two cups of rice being 4 points each, the hot dog, and a cheese wedge it’s going to be a 10 point day after lunch. D: Oh btw, I bought a bag of mini Babybels at Costco tonight (after hearing Kaolian rave about em) and I have to admit the wedges taste a lot better. The Babybel is more sour. Good news is Baby Girl loves them. But then again, she’s like Exodus and would eat a shoe if it had cheese on it. 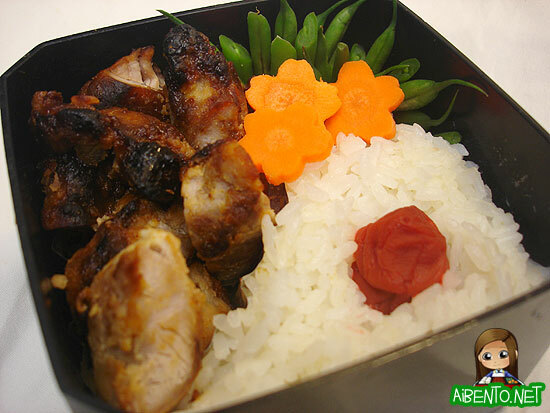 The Miso Pork Bento was made using Box #31 – Black Lacquer Cherry. Click here to view bentos made using this box.